To change the email address we have listed for you in our system, please email a request to infoupdates@esri.com. To change your mailing address, enter your information using one of the options and click the appropriate link on the following page. If you signed up using an email address you can use that to access your subscriber information, or you can enter the subscriber ID and zip code on the print publication you are receiving. How do I change the name, company, department or job title on my subscription? The name, department, and job title on your subscription(s) can be changed using the options above to manage your email preferences or print publication preferences. To change the company name we have listed for you in our system, please email a request to infoupdates@esri.com. If this is in reference to a print publication, please include your Subscriber ID in the email. 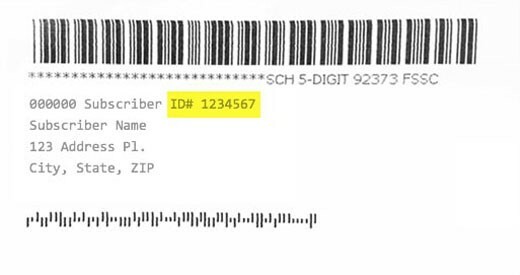 Your subscriber ID number is located on the back cover of the publication directly above your name in the mailing address (click here to see what it looks like). I’m getting multiple copies of a print publication. How do I stop them? You will need to unsubscribe from each copy individually. Each copy you receive will have a unique Subscriber ID, which is located on the back cover of the publication directly above your name in the mailing address (click here to see what it looks like). Use the options above to manage your print subscription preferences, entering the Subscriber ID and zip code printed on the publications you want to stop receiving. How do I change or remove print publication subscriptions for multiple people? Using the Subscriber ID numbers, you will be able to remove people individually using the options above (the box for managing your Print Publication Preferences). If you received your print publications in a bundled stack with a facing slip, you can manage subscriptions for multiple people here: http://publicationsforms.esri.com/facingslip/index.cfm. I’m entering the email address receiving email content from Esri, but am getting an error. Make sure it is the original email address you signed up with. If you are using email forwarding, try entering the address of the pass-through email. If the problem persists, please contact infoupdates@esri.com. I subscribed to something using my email, but haven’t received anything. Try checking your spam filter or folder, or adding an exception for our email domain, @esri.com. Depending on your organization, you may need to contact your IT administrator to let Esri’s email content through. If the problem persists, please contact infoupdates@esri.com. How did my email or mailing address get on Esri’s list? Esri offers free email and print subscriptions to everyone who enters our database. Ways that you might have entered our database can include registering for an Esri event, giving your information at an Esri tradeshow booth, signing up for a webinar, or filling out interest forms. How does Esri use my personal data? Esri takes our responsibility to protect your privacy seriously. We are committed to respecting your privacy by providing transparency in how we acquire and use your information, giving you control of your information and preferences, and holding ourselves to the highest national and international standards. Learn more about Esri’s privacy policies at https://www.esri.com/en-us/privacy/overview.